creator’s Family Reclaims the Rights to Superman -NY TIMES- March 29, 2008 - Time Warner is no longer the sole proprietor of Superman. And it reserved for trial questions over how much the company may owe the Siegel heirs for use of the character since 1999, when their ownership is deemed to have been restored. Also to be resolved is whether the heirs are entitled to payments directly from Time Warner’s film unit, Warner Brothers, which took in $200 million at the domestic box office with “Superman Returns” in 2006, or only from the DC unit’s Superman profits. THIRTY years after dropping out of university as a failed second-year art student more interested in drinking beer at the pub across the road, musician, writer and actor Nick Cave has been embraced by academia and presented with a doctorate. Cave, who quit uni to embark on what would become a seminal career as a young punk singer and later dark and brooding writer and performer, was awarded the honorary degree by the same institution he walked out of in 1978. I previously wrote about Cave here, and there's a portrait drawing too. 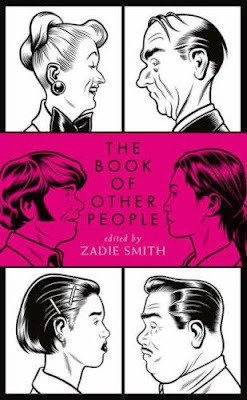 i'm reading the Zadie Smith edited The Book of Other people. I like the way Daniel Clowes (four pages in colour) and Chris Ware (fifteen pages in colour) are presented as authors among other authors, such as Lethem, Foer and Eggers, with the works arranged alphabetically after the name of their titular person. 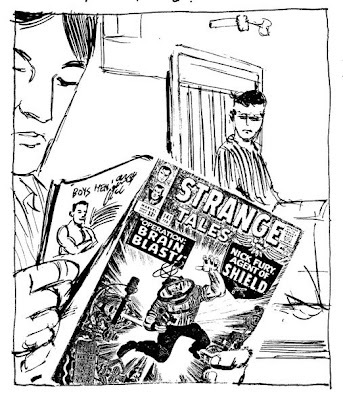 And in the contributors section at the back 'His books include Ghost World etc..." though Ware spoils it at the last minute: "is the author of Jimmy Corrigan- the Smartest Kid on Earth. He is currently serializing two new graphic novels..."
What sort of actress doesn't know her whos from her whoms? The narrative is in the first person, fictional Judith Castle writing. Since 'who' (as subject of verb 'to be') is correct in the second line (twice), am I to read this as some kind of high irony and an undependable narrator, which would be a dodgy trick in these grammatically confused times, and anyway the rest of the story doesn't support that. Alternatively it may be a typo caused by the unfortunate editorial removal of a letter 'm' from the end of line two. Or am I to ascribe it simply to authorial carelessness? The second part of How Art Made the World aired this week here in Australia. Its subject was the first pictures made by humans, in the caves of Altamira and Lascaux, and Dr Nigel Spivey asked the question "How did the first picturemaker make the first picture when he had never seen a picture before?" This is such a true conundrum. I often watch our dog Monty in front of the television. If a dog barks on screen, Monty rushes out of the house to try and find it. In other words, the moving lights on the screen are meaningless to him. He is incapable of seeing pictures there at all. It must have been the same with humans. We had to learn to see a picture and people were around for many many thousands of years before they got around to painting the first one. What made them think of it? I recall a similar argument I had many years ago on the subject of drawing and painting 'photographically.' I held that an artist logically could not have painted 'photographically' before the invention of the camera. Photographically is to be differentiated from 'realistically'; the seen world registers differently through an eyeball than through a glass lens. I therefore welcomed Hockney's theories claiming that artists were using lenses to project images from life onto their picture surfaces as early as the Renaissance, because it explained a couple of anomalies in my system, like Holbein for instance. The world being a thoroughly stupid place, Hockney's observations were immediately interpreted as a claim that artists had 'cheated,' and the matter was argued vociferously by the flat earth society over at Artrenewal.com. Following my repeated statement on Tuesday of my fondness for Vince Colletta's work, his granddaughter dropped this comment way back in my original post where it may be overlooked, so I'll copy it to here. Thanks, Katherine.. I'm not sure if this will even be read by anyone but Vincent Colletta was my grandfather and it greatly disturbs me to see the uneccessary, unkind things people have to say about the most wonderful man I have ever had the pleasure of knowing. For the record this man was entirely dedicated to his work and was passionate about it until the very end. I should know I was there- watching him day after day in his basement at his drawing table putting forth everything he had to the point we didn't really have much time to spend together. As long as I was quiet and behaved he would let me sit next to him and I will never forget those memories. I ask to all those with their negative comments to try and exude some class and respect for a man that truly loved his family and worked so incredibly hard to create works of art for millions of people to enjoy. Lets not forget that no one, INCLUDING YOURSELVES, are perfect- we all try as best we can. the choice of one's author photo is a thing one should not make lightly. As I write this, I have a dog subbing for me in the 'profile' photo over there on the right, while I wait for a decent image to turn up. They get harder to find as you advance, it goes without saying. Back when I was living in Britain in the early '80s, on those occasions when I picked up the Guardian or Observer (on Sundays) for something special, such as Posy Simmonds' 'Little Match Girl' colour Christmas comic in 1984 (which I reread yesterday), I'd always notice Sue Arnold's photo at the top of her column, and feel an urge to keep it. Having no function in my filing system for salting away something so random, I'd just clip the photo, or the whole column, and stick it in with the other article I was saving, knowing that I would accidentally come across it at some future date. I did it quite often, and one day when my heirs are rummaging through my files they will have cause to wonder about this odd obsession, this paper stalking. I have no way of knowing if the lady herself looked just so, or if she did but several years in the past, as one often finds with author photos, but that is beside the point. An image has its own life and makes its own way in the world. If the Mona Lisa could have tilted her head just so then we would have understood the half-millenial appeal of that famous portrait, and the mysterious allure of the smile is about equal. Perhaps the spectacles conjured for me the possibility of an imaginary scholarly soulmate. Today, when the wife of my bosom looks at me over the top of her specs, as she has of late needed the ocular assistance, then flags flutter in the heart of Eddie Campbell. I wondered what the lady journalist had been up to since I last filed her author photo, and was horrified to find that she had lost most of her abilty to see. I was also disturbed by the way the internet leaves all our positions on an argument still jostling side by side with no minder between them should a fight break out. 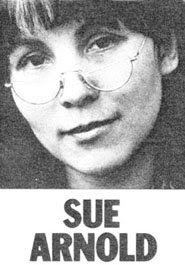 Journalist Sue Arnold wrote in The Observer in September 1997 of how smoking Skunk temporarily restored her vision. The Observer, -Sunday January 18 2004. Oh well, I think in my next profile photo I shall go for that professorial look over the tops of my specs. Every time I look at it I'll be reminded of a pair I used to have that would always be slipping down my snozzle. 'Why do you wear your glasses on the end of your nose?' a girl once asked me. 'They'd do me no good on the end of my willy.' I replied professorially. in my book, After The Snooter, I drew this scene in which I discovered my first American comic book. So in the middle of the night I sneaked over to the other kid's bedside table and secretly read his comic. 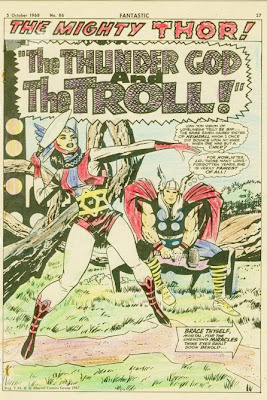 For a moment I thought of stealing it, but then in that special logic of childhood I figured that anything as wondrous as the drawings of Jack Kirby would be missed and the hospital would send somebody out after me to get them back. Shortly after this I started collecting the black and white British reprints of the Marvel material. I used to colour them with wax crayons because I knew the originals were in colour as I'd seen one that day in the hospital, and I wouldn't stand for anything incomplete in my collection. Virtually all of the Marvel line was represented across five weekly titles. I recently came across a couple of loose pages I picked out of the pile as mementos before I threw it all in the trash. These are dated '68. I'd have been 11/12 years old. 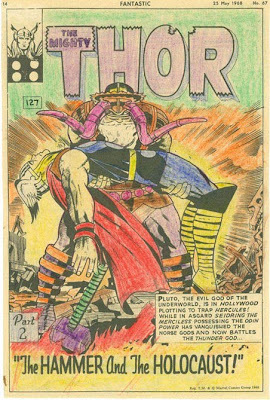 I coloured ALL of the stuff, all the Hulks and Avengers, the whole lot, but the thing you should notice about the pages I chose to keep is that they are examples of THOR that were inked by Vince Colletta. The British publisher was in the habit of removing the credits, but that never fooled wee Campbell; it just made him look harder. 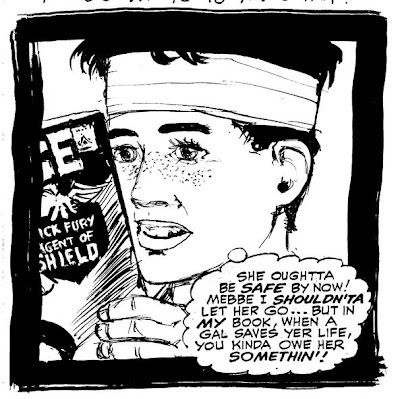 A while back I wrote a post here about how Colletta was my favourite comic book inker of the 1960s. For some unfathomable reason beyond all absurdity, it was and continues to be the most visited post I've written. I almost said popular there, but that would be the wrong word, for I was vilified in many places for uttering such an opinion. Even people you would think could not possibly give a hoot, I found them stopping me in the street, in San Diego during the convention, the only place everybody knows my name, sadly, and even somebody such as Gary Groth had to get his two cents in and call me an idiot. People generally can't stand by and allow you to have an opinion they don't share. ut otherwise, I have always thought Easter Sunday the dullest day of the year. It's the day everybody has gone home (to see the 'rents, as Callum would say), and the shops are closed and all you have are the movies you rented yesterday. In the profile of Alan Moore I linked to on Friday, it says: "He believes most modern films are not only artistic failures but "probably detrimental to modern culture." And I agree. So what did we have to watch? Firstly Elizabeth; the Golden Age. 'Comic book' is the default genre for the modern movie. I was able to persevere with the historical inaccuracies of this one up to the moment when Queen Elizabeth turned into Galadriel and the Sir Walter Raleigh into the Sub-Mariner. I can guess how it ended but I don't care. There is an implicit understanding with regard to the pop singer biopic, and that is that the viewer will accept that the subject had more talent than you and me, and was the idol of the multitude, but only if it can be shown that he/she lived a life of unremitting misery, half caused by circumstance and the rest by his/her self. thus Walk the Line and the present subject, La vie en Rose, about Edith Piaf. I didn't make it to the end and I don't care. We did take Monty for a walk on the beach. Drove for an hour then discovered we forgot to bring his leash. I went into a gas station (as the Americans would say) and had a choice between ten meters of string and one of those elastic jobs with the hooks at the ends for fastening your luggage to the roofrack. Inexplicably I bought the string and missed out on the comic possibilities of the other. Damn. Even my timing is off on Easter Sunday. I walked out of the house today to find that the world has gone all witty overnight. I passed a billboard for the new Alfa Romeo. "Smooth Torquer" it said. A little further along is the 'adult' shop, FRISKY BUSINESS. 'Put a flair down there' is their slogan. 'Get your beer here! '- The Brews Brothers.